Has Uncle Sam Ever Defaulted Before? The thought of Uncle Sam defaulting on his obligations is virtually unfathomable. I think we can accept as common knowledge that the crowd in Washington is not all that intelligent, especially when it comes to markets, but could they be so stupid as to risk defaulting on our debts? Why do I sense that many readers paused when thinking about that question? That fact alone strikes me as an indication of how far we have declined in terms of fiscal prudence and integrity in our nation. But this begs the question, have we ever defaulted on our debts before? There were three prior US defaults, none of which are comparable to the possibility of one occurring today. In the 1780s, the Articles of Confederation allowed the US government to borrow money but did not grant it the ability to raise revenue. Alexander Hamilton eventually restructured the debt in 1790, deferring interest for 10 years. In 1933, the US Congress repealed the gold clause, which then allowed the US to repay gold-backed bonds in dollars that had been devalued by 41% vs. gold; some argue that this was a default, although the move was upheld by the Supreme Court in a 5-4 vote. In 1979, technical difficulties and massive volumes resulted in the Treasury being late in redeeming T-bills. Payments soon resumed, but the Treasury temporarily refused to pay additional interest covering the delay period. Eventually the Treasury paid back interest, and suffered a reputational price as well: T-bill rates rose by 60 basis points after the first delay and remained there for several months. Given the size of our obligations, the economic implications of a potential default would make the failure of Lehman Brothers look like child’s play. Yet, here we sit and the prospect of just such a debacle is addressed by some as perhaps not that big a deal. I can assure you that it is the biggest of deals. Why so? 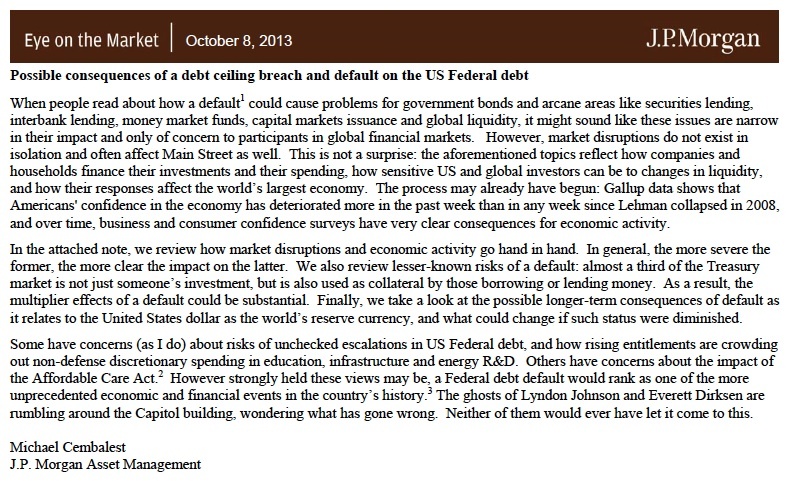 What are the long term implications of default? While our markets and economy would crater, the US dollar would lose its status as the world’s reserve currency. Over the last century, both domestic and global reliance on US capital markets have deepened accordingly. However, being the world’s reserve currency bears risks if that status becomes impaired. Non-US investors own $25 trillion in US dollar assets, a number which is much greater than what US investors own abroad even though the US is only 30% of World GDP. As a result, a default would not be just a domestic affair, and may have consequences that end up affecting the United States through credit markets, exports and/or foreign direct investment. What are the hallmarks of being a reserve currency? . . . the dollar dominates global foreign exchange markets, which in turn helps keep the cost of capital low for US borrowers. This low cost of capital has allowed the United States to develop the deepest and most liquid capital markets in the world, which benefits the Federal government, states, municipalities, banks and non-financial corporations. A default is not just tinkering with the mechanics of government, but with the underpinnings of the largest aggregation of financial assets in existence. Among the US assets owned most often by non-US investors is of course Treasury bonds: non-US investors now own half of the Treasury market. While costs of servicing the Federal debt are currently low, given the magnitude of the debt, servicing costs could rise if perceptions of Treasury risks changed. While some market participants view this as unlikely, we have already seen such a shift in the sharp decline in demand for US agency paper by non-US investors. The notion that there is no current practical alternative to the dollar as a reserve currency is hardly the kind of foundation upon which to build an argument for default, or to claim that its consequences would be mild. There would be nothing mild about a default. It would be the absolute pinnacle of nonsense on cents. The chances of a default might be very slim but, if it were to happen, it was nice knowing you. This entry was posted on Saturday, October 12th, 2013 at 9:10 AM	and is filed under General. You can follow any responses to this entry through the RSS 2.0 feed. You can skip to the end and leave a response. Pinging is currently not allowed.